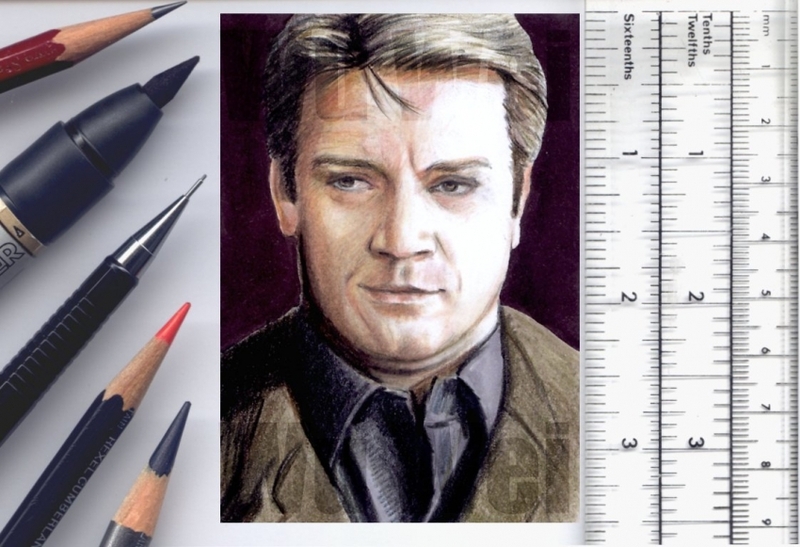 An ACEO artcard depicting Nathan Fillion in the title role of tv series Castle. 2½x3½ inches(6.3x8.9 cm), graphite and coloured pencil with blendable marker on Bristol board. Original card for sale here on Ebay http://www.ebay.co.uk/sch/miniartz/m.html?_ipg=50. Honestly, this is a very typical Castle expression that would get on my nerves when I watched the series (though that's not why I stopped). However, it is perfectly rendered and the light and colours are great (as always)! Yeah, there's a smugness about him isn't there? Exactly. He's the man who thinks that all it takes to solve a criminal case is refer to one of his novels. Beckett is only there for company plus action involving guns and handcuffs.